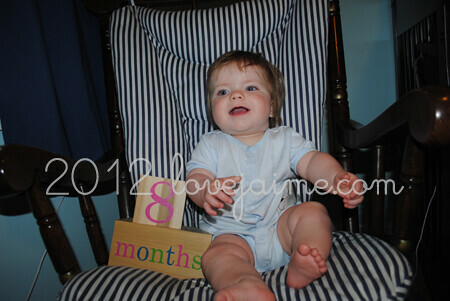 Our little guy is 8 months old! He weighs 18 pounds, 13 ounces. (I weighed him at home and thought he was right at 19 pounds, give or take two ounces, so my scale is very close!) He’s eating solids twice a day, but we’re starting three times a day this week. He’s still nursing 5-6 times a day. He occasionally sleeps through the night, mainly when his teeth aren’t bothering him. I think we’re heading into the pulling up territory. He’s looking at things like he *wants* to pull up, but isn’t exactly sure how to do it yet. 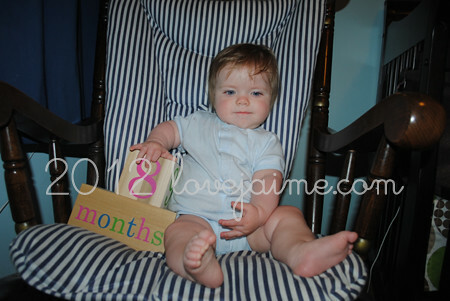 He’s sitting up a lot more now. And, of course, rolling and spinning. The kid gets around. He’s dealing with his play yard (gate – playpen – whatever you want to call it) pretty well. He can move, he has toys, and we’re not constantly moving him out of things he shouldn’t be in. Oh, and he does this great dragging-crawl. I got it on video (on my iPhone), but it’s sideways. Hoping I can share it with you at some point. Chloe has realized that she has to move quickly if she doesn’t want her tail grabbed. He graduated to his duck bathtub and loves it! We spend more time in baths now, as he can splash so much more. I just love these baby updates. It is so fun to watch Lucas grow!